You are at least 100 pounds overweight or your Body Mass Index (BMI) is 40 or higher (or at least 35 if you have one or more weight-related health conditions). You have been overweight for at least 5 years. You have made serious weight loss attempts with other methods but only had short-term success. At CHRIAS, our board-certified surgeons are dedicate to provide the most advanced and unsurpassed care in Delaware, Maryland, Pennsylvania, New Jersey and nearby regions. To better serve you, we offer our services in multiple convenient locations. There are other weight loss operations currently being performed at other centers nationally; however, our surgeons do not perform the vertical banded gastroplasty, biliopancreatic switch, Fobi pouch, or jejunoileal bypass. Choosing between the different operative procedures involves the surgeon’s preference and consideration of the patient’s eating habits. At CHRIAS, Drs. Irgau, Wynn, Peters and Singh perform laparoscopic weight loss surgery using minimally invasive techniques. During a laparoscopic procedure, surgeons make several small incisions, approximately 5 mm to l.5 cm in size, rather than one large incision. Surgeons also use long, thin surgical instruments and insert a narrow video camera through one of the small incisions to view the operative site on a nearby video monitor. Laparoscopic approach to surgery results in minimal skin cutting, rapid healing, faster recovery, and less postoperative pain than the traditional surgery. However, it is still major surgery and requires general anesthesia. In a small number of patients the laparoscopic method cannot be performed. The likelihood of choosing or converting to the “open” procedure may be increased by a history of prior abdominal surgery, inability to visualize organs or bleeding problems during the operation. The decision to perform the open procedure may be made by your surgeon either before or during the actual operation. When the surgeon feels that it is safest to convert the laparoscopic procedure to an open one, this is not a complication, but rather sound surgical judgment strictly based on patient safety. The CHRIAS team is committed to the highest standards of surgical care of patients suffering from morbid obesity. We firmly believe that the surgical procedure is only one component of a comprehensive bariatric program and they attribute their excellent results not only to their surgical expertise, but to the multidisciplinary approach they have adopted in their patient care. The CHRIAS weight loss surgeons work in close cooperation with a multidisciplinary team, which includes an endocrinologist, a psychologist, a nutritionist and an exercise physiologist. These teams also offer support group meetings at their facilities. If you are interested in a consultation for weight loss surgery, please attend a free weight loss surgery seminar where you will be able to schedule an appointment. Your initial consultation will be done through Christiana Institute of Advanced Surgery. If you are a candidate for surgery, your procedure will be done by our physicians through Christiana Institute of Advanced Surgery. If the insurance company turns down your request for bariatric surgery, you may be able to appeal the decision. The specialists at CHRIAS will help you with the appeal process, should this become necessary. If your insurance does not cover bariatric surgery, you can also pay for surgery out of pocket or use a loan or a financing program for medical procedures. Ask us about financing options we offer. In the year you finance or pay cash for your bariatric surgery, you may be eligible to receive thousands of dollars back in potential tax savings. IRS Publication 502 states you can deduct your medical and dental expenses when they total more than 7.5% of your Adjusted Gross Income (see IRS publication 502, page 2 — http://www.irs.gov/pub/irs-pdf/p502.pdf [Option Link 2]). Check with your accountant or tax advisor for more information. Looking for a Non-Surgical option? If you are considering weight loss surgery, it is important to understand all the information and have your questions answered. After all, weight loss surgery can change your life! CHRIAS surgeons perform weight loss procedures at Centers of Excellence. 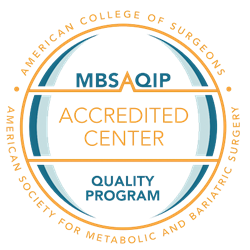 The ASMBS and ASC recognizes programs with a demonstrated track record of favorable outcomes in bariatric surgery.